The Catchmaster pantry pest trap works within a couple days of setup. The natural moth pheromone drew me to choose these moth traps. I prefer not to use any pesticides near any food my family is going to eat. My husband’s favorite is cornmeal chicken fried steak which I made for years until he went on a low fat diet. Now most of the steaks are prepared on the forman grill. So the cornmeal had probably sat at the back of the pantry for at least 9 months. 4 weeks later more moths…. From researching online I found that I had meal moths (I guess they were indian meal moths, but I found them in the abandoned corn meal). When the traps arrived, I didn’t care what they looked like, I just wanted them to work.. and as you can see from the picture I took 3 weeks later, the trap was nearly full. 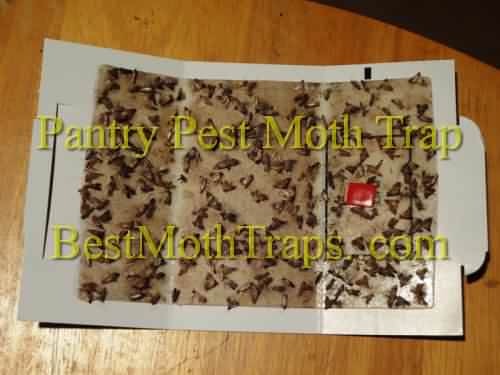 Thank you pantry pest trap! My pantry is really packed, there is frankly very little shelf space and the trap has to sit on the shelf and take up space.. directions for moth trap placement just don’t consider a small pantry. I ended up using some tape and hanging the trap from the shelf above with masking tape. That way I didn’t loose any storage space. 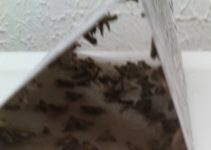 Moths fly, should a moth trap hang? I mentioned that my shelves are wire, the outside of the moth trap is wood grain brown, sitting in my pantry it just stood out. I know many people probably have wood shleves, but the trap sorta felt like the old station wagon with wood sides… Just a bit dated. 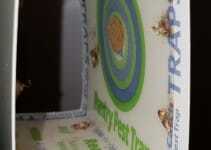 Overall the trap worked and that’s what mattered! I agree with Vanessa, my pantry is packed full and even when I find shelf space, it’s between a couple bags and the bags fall into the traps causing a mess.. Some brands have a hole punch in the top of the tab, but don’t include a twist tie, or anything to use with it.. Some type of hanger would be a plus.